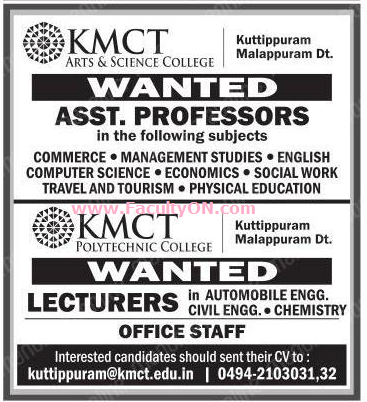 KMCT Polytechnic College, Malapuram has advertised in the MALAYALA MANORAMA newspaper for recruitment of Lecturers jobs vacancies. Interested and eligible job aspirants are requested to apply immediately from 09th May 2018. Check out further more details below. About College: It is seen that the Polytechnic education has lagged behind the degree level education. As a result of this, there is an under utilization of qualified engineers. The high cost of diploma education and relatively poor financial capacity of the aspiring students is not attracting private investment into diploma level education. How to Apply: Interested and eligible candidates are requested to send CV along with copies of certificates / testimonials and recent PP size photo to the email address provided here.